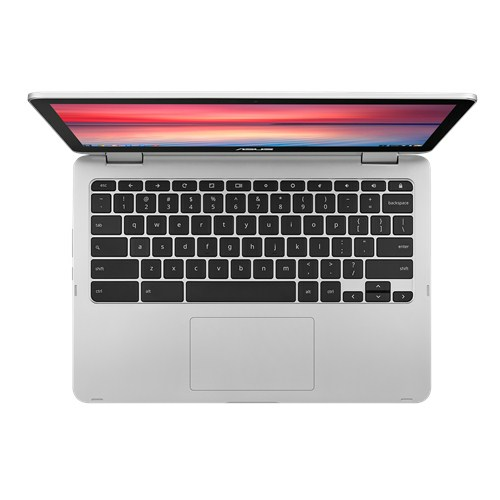 A highly portable and well-designed Chromebook, although the Flip C302 is more expensive than most of its rivals, Pixelbook aside. The ASUS Chromebook Flip C302 does just about everything right -- battery, screen, keyboard and performance are all good to excellent. For less than $500, this is probably the best Chromebook on the market right now. The Asus Chromebook Flip C302A is not the best-selling Asus Chromebook on Amazon. That distinction currently goes to its cousin, the Asus Chromebook C202A, which is actually the only low-cost Chromebook I’d recommend. 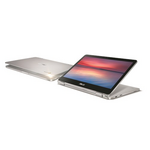 When you’re ready to step up to advanced features, however, such as a nicer display, 360-degree hinge, and a real metal chassis, you can stay within the Asus family and graduate to the Chromebook Flip C302A. It’s a Chromebook that you can keep using for years (perhaps even the full five years that Google promises to support it) without feeling constrained by the hardware. And when Android support becomes official, I know you’ll like that tablet mode. 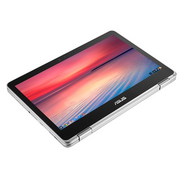 Asus has delivered a good high-end Chromebook here -- but it is expensive. The real question is whether it does enough for the price, or whether it's worth shelling out for a full-fat laptop for all the extra application support and storage that these offer. With Android apps for Chrome OS potentially a game-changer in this respect, the Asus Chromebook C302 Flip has come along at an interesting time. The Asus Chromebook Flip C302C scores very well in the usability and portability stakes, but its ability to flip into a chunky tablet can be seen as a bit of a pointless gimmick. The Asus Chromebook Flip C302CA is a Chromebook that feels like a £1000 laptop in many respects. Its all-metal case and low weight make it a good choice for those tempted by a MacBook or Windows machine for work while travelling, who just don't have the spare cashflow. We're not there yet, and so the highest praise I can give Asus is that this fairly innocuous and forgettable computer is innocuous and forgettable in the best ways: it looks good, it works well, and I don't have to worry about it. It's a great baseline for future Chromebooks to either match or try to beat. It's not necessarily the best one, but it's a solid starting point for what you should expect. It's standard-issue. The Asus Chromebook Flip C302CA sits in the sweet spot, we believe, for Chromebooks, as long as you view this 2-in-1 convertible model as a laptop first and tablet second—and not the other way around. 80% Asus Chromebook Flip C302CA Review: Is It Good for Business? 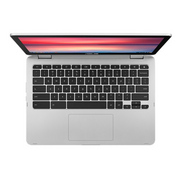 The Asus Chromebook Flip C302CA is already a pretty compelling option for basic productivity, with a crisp 12.5-inch display, solid performance and a versatile folding design. And it’s only going to become a better work machine when it gets full support for Android apps later this year. There's a lot to like about the Chromebook Flip C302CA, including its elegant aluminum design, sharp screen, solid battery life, strong performance and bend-back design. When the Google Play Store finally rolls out to Chrome OS in earnest, the Flip will be even more compelling than it is today. What I can say, without hesitation, is this is my favorite Chromebook on the market. No, the Samsung isn’t available yet and that opinion may change at that point. I’m not sure. For a Chromebook, ASUS C302CA-DHM4 is quite a heavy-duty unit. Its Core m3 processor and 4GB RAM means your browsing experience will be same than in regular, Windows based laptops. Also the flash storage of 64 gigabytes is double from what you usually see in Chromebooks. The Full HD display is sweet, turning a full 360 degrees, giving you a Chrome tablet to play with. Battery life has been verified as a solid 8-10 hours. Sure, the Asus is tad more expensive than your typical Chrome laptop, but for the money you get excellent quality and performance! Asus Chromebook Flip C302: Is It Good for Business? Other hardware highlights include a sleek aluminum design and a USB-C port, which is nice for fast data transfer and connecting newer USB-C accessories. Check back for a full review of the Asus Chromebook Flip C302 soon, or stick around and check out our top picks for the best business laptops currently on the market. Positive: Decent hardware; nice performance; compact size; light weight; good display. 85.24%: Es handelt sich hier um eine überdurchschnittlich Bewertung. Dennoch darf man nicht übersehen, dass 10-15% aller Notebook-Modelle eine bessere Beurteilung erhalten. Der Prozentsatz entspricht am ehesten der Verbalbewertung "gut". Man darf aber nicht vergessen, dass Magazine nur selten richtig schlechte Beurteilungen verteilen.